Most people that know me, know that I am a HUGE fan of baby wearing. HUGE!! So, as we have been getting closer to getting Patrick, knowing he is not a baby, but knowing I still need and want that bonding experience with him, i have been looking for a way to carry him without killing my arms! While in country, a stroller is not a great option. Plus, using a stroller, he is facing away from me...no bonding happening there! I could wear a backpack made for larger children, but again, no bonding, as he is looking at the back of my head and I can't see him at all! 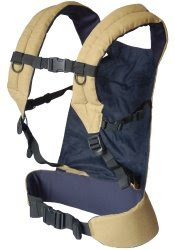 I have been looking and looking for a front or hip carrier that will accommodate a larger child. I found it!! Check It Out! This thing holds up to 62 pounds! Now, I know, I can't and won't carry him ALL the time. But this will be great, especially while in his country and in the airports on the way home. And, I will be able to use it when we first get home while we are working on attachment. I was so excited to see that they made a carrier for older/ larger children. I am so excited to get to wear Patrick!! That looks good, but... where will he go? I don't see any straps that would hold a little one... Am I just missing the obvious? The back of it is the seat, the leg holes ans arms holes are big. If you click on the link, you an see some parents wearing it, and see how "baby" fits into it. It is definately made for bigger kids; I don't think it would be secure for a younger/ smaller child. Patrick wears about a size 4, so he really is as big as he looks! I love it! I have an awesome backpack, but I couldn't see putting either girl in there and expecting it to help with bonding. This is awesome! I have got to order one... Thanks!